The following featured videos are offered by High Conflict Institute. To view the full list of professional development video training, visit our Online Learning page at High Conflict Institute. This training is for lawyers, counselors and mediators who wish to provide 1-2 sessions of New Ways Pre-Mediation Coaching to their clients. This training explains how to use the Workbook and Coaches Manual to prepare a client for the most productive use of mediation – even with a potentially difficult party. This training qualifies you to be listed as an approved provider of the Pre-Mediation Coaching Program Model. This training is for parent education professionals who want to incorporate this skills building method into their parent education course. 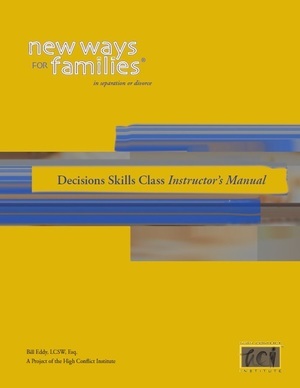 It explains the Workbook and Instructor’s Manual, and how to manage potentially high-conflict clients in your class. This training qualifies you to be listed as an approved provider of the Decision Skills Class Program Model. R U Talkin to the Wrong Brain?